Like father, like son. And I like this father – Papa John DeFrancesco – and his son, Joey. Both men can play the Hammond organ with the necessary gutsiness and blues feeling, although here Joey supports his Dad on various other keyboards including the electric piano. They are ably supported by the Banda brothers – a bassist and drummer whose experience playing for Poncho Sanchez ensures some fiery music. The album opens suitably with an original blues written by John, and we know we are in for a set of no-nonsense swinging organ music in the fine tradition of Jimmy Smith or Groove Holmes. The slow-burning version of I’ll Close My Eyes is certainly in the laid-back style of Holmes, with Joey laying down washes of drifting colour on the synthesizer. What Now My Love is given a more propulsive but still relaxed feel, while The House of the Rising Sun burns with a slow but intense flame. Eddie Harris’s Cold Duck Time catches the right funky sense, propelled by Ramon Banda’s mixed percussion. Jeff Lorber’s Tune 88 has a similarly funky rhythm, albeit with more straightforward drumming. The two other tunes on the album are originals by John: the extrovert Fields, dedicated to Joe Fields (for whose labels John has recorded all his albums), plus a lilting jazz-waltz called Pokuscabadabra (a tribute to Bugs Bunny and Warner Brothers cartoons!) with an excellent drum solo from Ramon Banda. Joey mostly stays discreetly in the background, as he did on Legacy (Concord) the album he made with Jimmy Smith shortly before Smith died – and I’m still listening to that irresistible mixture of keyboard instruments. 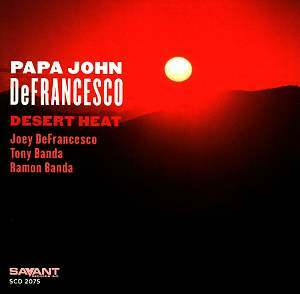 The album gets its title from the fact that Papa John recently moved to the hot desert state of Arizona, where his son already resides. They are sure to keep things simmering.